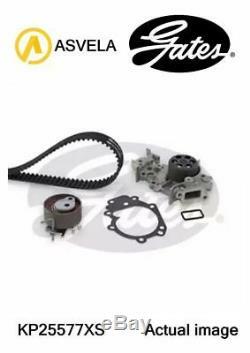 Water Pump & Timing Belt Set for DACIA, RENAULT, NISSAN LOGAN, LS, D4F 732, D4F 734. Asvela shop will be also on holidays after which we back to the regular working mode on 02.01.2019. All tech data details in the listings description section are provided from official manufacturers' tech databases. Use engines info and vehicle YMM compatibility chart for general guide. To avoid any kind of misfitment, when you doubt in compatibility, or cannot find the correct item, please, contact Asvela tech support before purchasing. Strictly important to provide VIN along with your detailed request since there can be different options for your car specific tech characteristics. The VIN a 17-character number (digits and capital letters)can be found by looking at the dashboard on the driver's side of the vehicle or on the driver's side door and look at the door post. LS E4M CN0 LU1/2 F/JP0 BR0/1 CR0/1 KR0/1 C06 BB0/1/2 CB0/1/2 KC0/1 FC0/1 LB0/1/2 X76 X80 D4F 732 D4F 734 D4F 780 D4F 782 D4F 772 D4F 764 D4F 770 D4F 728 D4F 786 D4F 740 D4F 784 D4F 706 D4F 742 D4F 702 D4F 708 D4F 712 D4F 714 D4F 722 D4F 716 D4F 730 D4D 754. (DHL RULES) Please check "DISTANT Locations" tab for full list of post codes that will be taxed additionally. To ensure deliveries before Christmas closing, we kindly ask to send your orders at the latest on 20/12/2018. Packages sent by courier require signature. If you need our assistance, please let us to know. If you see that the package that courier tries to deliver is damaged, please fill up the claim form or do not accept it. NOTIFY US right away, we will arrange a replacement/reimburse your order A. Items that are sent in vacum or lubricated film cannot be opened if the retuns is issued. Please let us to know if you have not received our feedback, we will give feedback manually. The item "Water Pump & Timing Belt Set for DACIA, RENAULT, NISSAN LOGAN, LS, D4F 732, D4F 734" is in sale since Saturday, December 29, 2018. This item is in the category "Vehicle Parts & Accessories\Car Parts\Engines & Engine Parts\Belts".